The torrential rain and driving wind challenged even the most dedicated runners. 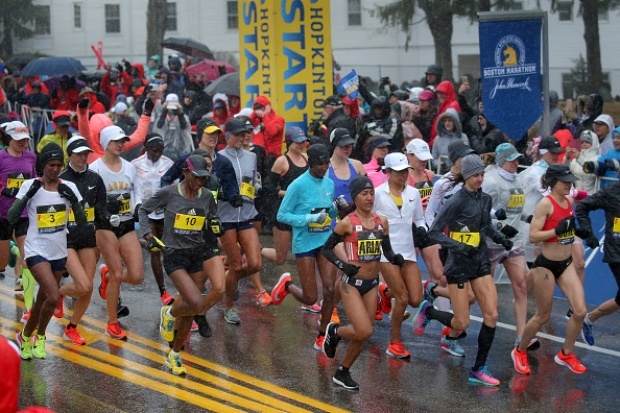 "Cold & wet conditions taking a toll on runners," Wellesley police said on Twitter, noting that several runners were treated for cold-related injuries across town. Wellesley Police Chief Jack Pilecki told MassLive that at least three elite women runners went down. One was taken to a local hospital and the others to a nearby medical tent. Wellesley fire also requested a warming bus after several runners began suffering from hypothermia. U.S. men's runner Galen Rupp, who finished second last year, reportedly dropped out of the race between miles 18 and 19 after suffering from symptoms of hypothermia and asthma. The conditions were so bad several towns opened up emergency shelters for struggling runners. 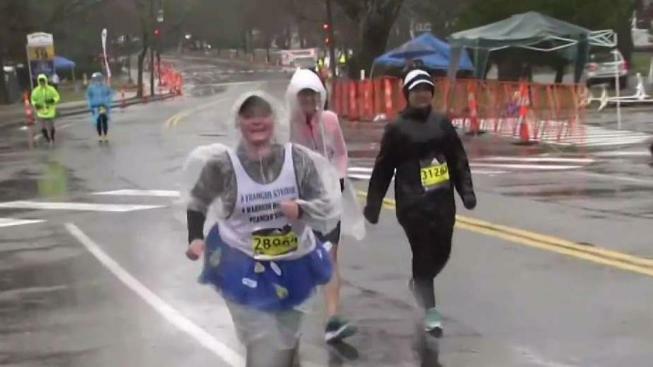 With some drier clothes, Hodge headed back into the driving rain where her fellow marathoners were still plugging away. Volunteers in Newton saw about 100 runners at the shelter that opened at Newton City Hall at Mile 19. Martin’s race was over after that. Runners were fighting Mother Nature in an attempt to make it to the finish line. Marathon bombing survivor Adrianne Haslet was also unable to finish the race after her body began to shut down due to the cold. "I was convulsing, my body temperature so low," she said on Twitter. "Arms stopped moving. Then legs." Boston Emergency Medical Services said medical tents along the marathon route and at the finish line had been visited by more than 1,000 people as of 2 p.m. They said they knew of at least four people who had to be taken to local hospitals. 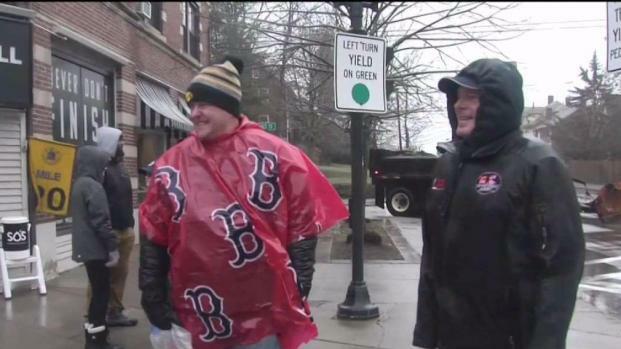 At Heartbreak Hill on this cold and rainy Marathon Monday, the heartbreak wasn't just for the runners. The Massachusetts Emergency Management Agency said the total number of ambulance calls were 100 and the number of people transported 72. Framingham emergency officials estimated that they alone had approximately 15 people who had to be transported. Warming centers were set up at Temple Ohabei Shalom and All Saints Parish in Brookline, the Community-Senior Center in Natick, Newton City Hall and Wellesley Fire headquarters due to the inclement weather. In addition to those fixed facilities, Brookline, Natick, Newton and Wellesley each received five warming buses to stage at various points along the marathon route for runners to warm up. race organizers say they treated about 2500 people today at the medical tents, mostly because of the cold weather.